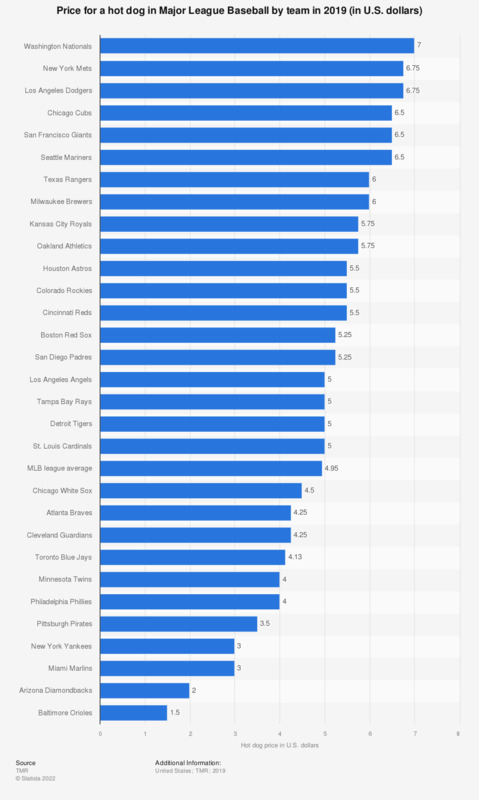 The graph ranks the teams of Major League Baseball (MLB) according to the price for a hot dog purchased at a concession stand in the stadium. In 2018, the Philadelphia Phillies sold hot dogs for 4.00 U.S. dollars at their games. The average price of a hot dog at MLB games has increased since 2010 from 3.79 U.S. dollars to 5.01 dollars in 2018. The price of beer, however, has decreased since reaching a high in 2012. The average price for a beer at an MLB game in 2018 was 5.98 dollars.